My dear ladies and occasional gentleman, my dear friend Veronica and I visited RHS ROSEMOOR’S ROSE WEEKEND. The weather was glorious as we were WAFTED by the FRAGRANT ROSES as we SAT and SIPPED a glass of ‘EL MURO’ 2012 MACABEO. Now I’m not saying it was the WINE but as we sat on the patio and looked out over the VERDANT and FLORAL gardens, a MOBILITY scooter trundled along. Sitting ASTRIDE in a JAUNTY fashion was a VERY IMPORTANT PERSON who you only generally see on the night of the 24th of December. He was INCOGNITO and wearing ‘NORMAL’ clothes but there was no mistaking the FLOWING WHITE HAIR AND BEARD. I’m not DOBBING him in. It’s nice to think he spends a little R & R amongst the ROSES in his downtime. FOUR FRUITY STICKS BARE ALL ! My dear ladies and occasional gentleman, I responded to a GREAT DEAL l I saw online: ‘4 DWARF FRUIT TREES THREE APPLE & ONE PEAR FOR £19.99 FREE POSTAGE’. 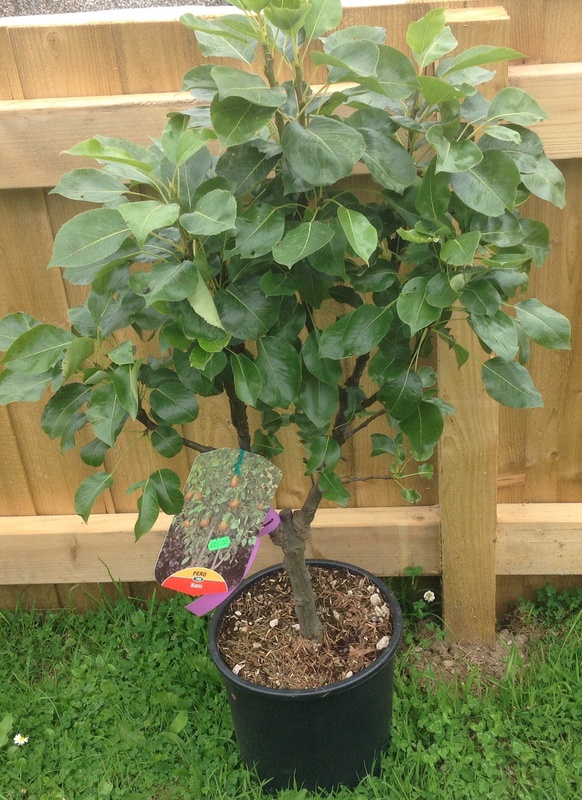 How could I resist, I had all ready purchased a little PEAR TREE locally and thought these would be ideal to assist me in creating a little ORCHARD in my FRONT GARDEN. According to Ronald I have bought FOUR STICKS! There may be quite a lot of LADYGARDEN BREAKFASTS before Eve can pick Adam an apple! P.S. Apologies for presentation, wordpress decided to do it’s own thing. It’s been a rough couple of days. I received an OUTSTANDING BILL for £400 for my deceased mother, a purchaser of my online auction item of ‘a child’s vintage pram for RESTORATION’ for which they paid £7.99 decided it wasn’t MUSEUM quality and complained and I bought 4 sticks! Firstly HE NEVER CLEANS THE TOILET! Secondly OF COURSE I NEED THE BL…Y TOILET BEFORE I GO TO BED! My dear ladies and occasional gentleman, I am not a vindictive woman but….. I sat Ronald down in the garden and TESTED it out. Ronald now RESEMBLES A TOOTHBRUSH! SUAVE STRAW HATS & PRIMPING DUCKS! Having been invited to a GARDEN PARTY Ronald and I were PRIMPING ourselves up for the event. Ronald looked smart but casual in a linen shirt and chinos, topped off with a rather SUAVE STRAW HAT. I wore a new beautifully patterned skirt in different shades of BLUEand a dark blue T with a sheer white shirt over. Having spent time on my MAKE-UP and especially my HAIR I was ready and presented myself to Ronald for his APPRAISAL. As if that wasn’t enough to DENT my EGO, whilst enjoying my first glass of RHINELAND HOCK and a CHIT-CHAT, a guest informed me that MINE HOSTS had named not a ROSE but a duck after me! My dear ladies and occasional gentleman please heed this WARNING for your own SAFETY. I have been suffering for the last two weeks with CATARRHH, I now know how the VIKINGS felt with their STEEL HELMETS because I am wearing one. Having searched online for a remedy I found one that I tried this morning. The recommendation was to put some DECONGESTANT VAPOUR RUB on the floor of the shower and the hot water would send the fumes nose-ward, clearing ones head. Great idea, being clever I thought it would be easier to smear a lump on my foot and then when I was in the shower I spread it over the floor. Mmm I could smell it already. This is when it all went WRONG! You could have used my shower floor to host the ICE-DANCING CHAMPIONSHIPS. Barely managing to stay on my feet I managed by doing the splits to WEDGE each foot painfully against the two sides and clinging on to the shower itself keep upright. From this PERILOUS position My next bad idea was to wash my hair thinking that the foam would wash the vapour rub away forgetting that I still had a wedge of the stuff on the one hand I could use. It certainly dissolved, running down my face and into my eyes, IT STUNG! Trying to shave my legs when they were stretched as far as they could without SPLITTING MY DIFFERENCE was hit and miss. I’d had enough but how to get out? If I let go of the shower workings I’d slip faster than a JELLIED EEL! The only thing for it was to crawl out on hands and knees. This was NOT a relaxing shower and I had to clean the stuff off the floor afterwards. So please don’t try this REMEDY but if any of you have a SAFE REMEDY FOR CATARRHH please share it with me. Let us NEVER forget the SACRIFICE and BRAVERY given by the men women and children during WW2 on this D-DAY. There cannot be one family who didn’t have someone who served either at home or abroad, some who were civilian casualties at home and abroad, we must remember them. My mother-in-law and father-in law served in the British Army, he was badly wounded at Dunkirk, spent a year in hospital and then with only 1 lung was sent back to the front. My great Uncle served with MONTY, my Grandfather was an ARP warden, my mother was BOMBED and seriously hurt when the first bombs fell on London. I could go on but I know you all have family members who did the same in WW2. This year we will all be remembering WW1 as well in which our grandfathers and great uncles served. Who cannot be moved listening to the stories of the veterans at the celebrations in Normandy. How sad that in 2014 we have so many wars all around the world. My dear ladies and occasional gentleman, this morning I was working at my lap-top when Ronald approached muttering. I apologise in advance for the more tender flowers amongst you for what I am about to impart. “I was just sitting on the TOILET when I noticed this, have a LOOK” says Ronald shoving both hands down the back of his trousers. “I don’t know if I want to” says I tearing myself away from my writing. He pulled his TROUSERS down at the back exposing his BOXERS. I’m not sure what I expected to see but I was relieved when he turned over the waistband and showed me the LABEL. Now you might want to chuckle at poor Ronald and his QUANDRY but his little face was CREASED with concern, so I took a look. I tried to reassure him and said it was unlikely he would have to go near a fire in his underpants.